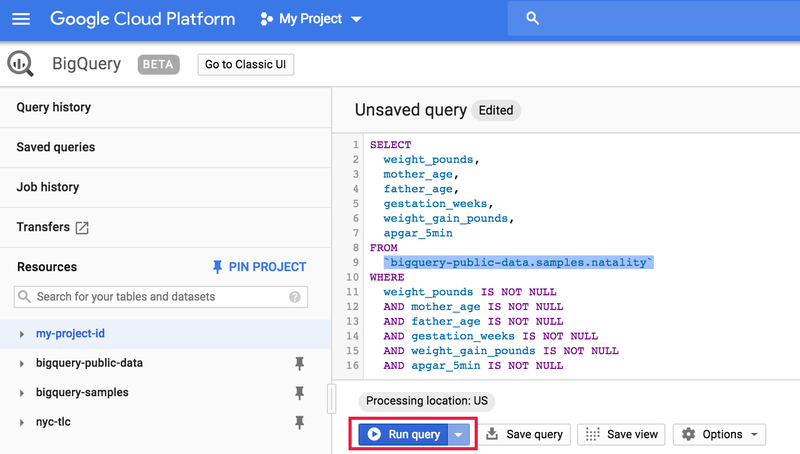 The Google BigQuery Connector for Apache Spark allows Data Scientists to blend the power of BigQuery’s seamlessly scalable SQL engine with Apache Spark’s Machine Learning capabilities. In this tutorial, we show how to use Cloud Dataproc, BigQuery and Apache Spark ML to perform machine learning on a dataset. 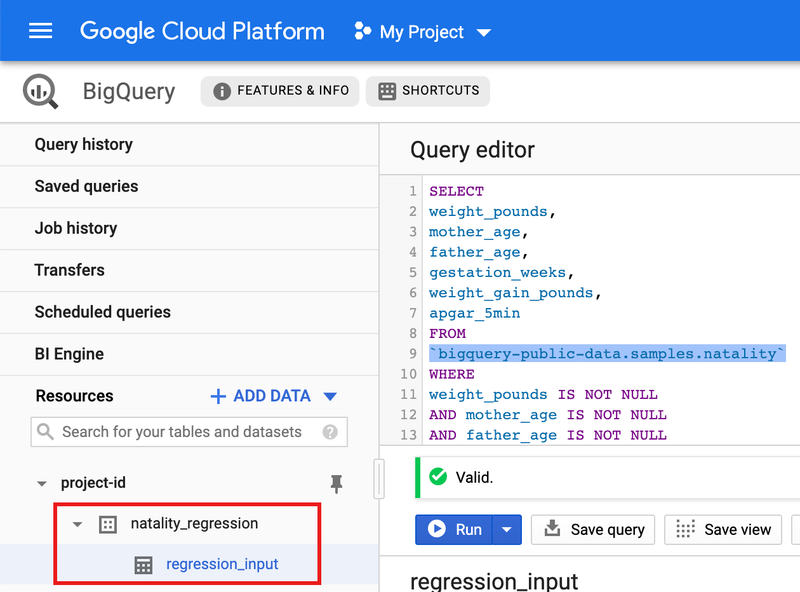 BigQuery is used to prepare the linear regression input table, which is written to your Google Cloud Platform project. Python running on your local machine is used to query and manage data in BigQuery. The resulting linear regression table is accessed in Apache Spark, and Spark ML is used to build and evaluate the model. PySpark running on the master VM in your Cloud Dataproc cluster is used to invoke Spark ML functions. Enable the Google Cloud Dataproc, BigQuery, Google Compute Engine APIs. Create a Cloud Dataproc cluster in your project. Your cluster should be running a Cloud Dataproc version with Spark 2.0 or higher, (includes machine learning libraries). If you are using Cloud Dataproc version 1.3 or higher (see Supported Cloud Dataproc versions), install the BigQuery connector. In this section, you create a dataset in your project, then create a table in the dataset to which you copy a subset of birth rate data from the publicly available natality BigQuery dataset. Later in this tutorial you will use the subset data in this table to predict birth weight as a function of maternal age, paternal age, and gestation weeks. Create a dataset in your project. In the left navigation pane, click the down arrow icon next to your project name, then click Create new dataset. For Dataset ID, enter "natality_regression". For Data location, you can choose a location for the dataset. The default value location is US multi-region. After a dataset is created, the location can't be changed. Never: (Default) Tables created in the dataset are not automatically deleted. You must delete them manually. Number of days: Any table created in the dataset is deleted after the specified number days from its creation time. This value is applied if you do not set a table expiration when the table is created. Click OK to create the dataset. You cannot add a description or a label when you create a dataset using the Web UI. After the dataset is created, you can add a description, and add a label. Run a query against the public natality dataset, then save the query results in a new table in your dataset. Click COMPOSE QUERY, then copy and paste the following query into the Query Editor. Click Show Options, then uncheck Use Legacy SQL to use Standard SQL. After the query completes (after approximately 1 minute), in the Query results panel, select SAVE AS →Save as table. Complete the Save as table dialog to save the query results in a "regression_input" table in your natality_regression dataset. Click Save. See Setting Up a Python Development Environment for instructions on installing Python and the Google Cloud Client Library for Python (needed to run the code). Installing and using a Python virtualenv is recommended. Copy and paste the natality_tutorial.py code, below, into a python shell on your local machine. 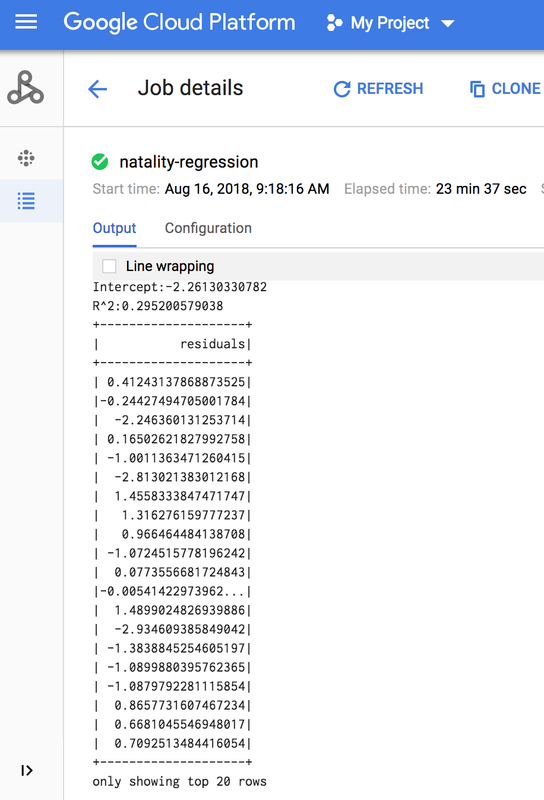 Press the <return> key in the shell to run the code to create a "natality_regression" BigQuery dataset in your default GCP project with a "regression_input" table that is populated with a subset of the public natality data. Run gcloud config list project to see the name of your default project. Run gcloud config set project project-name to change the default project. Run gcloud auth application-default login to set application credentials to your user account. """Create a Google BigQuery linear regression input table. * A new dataset is created "natality_regression." # Prepare a reference to a new dataset for storing the query results. 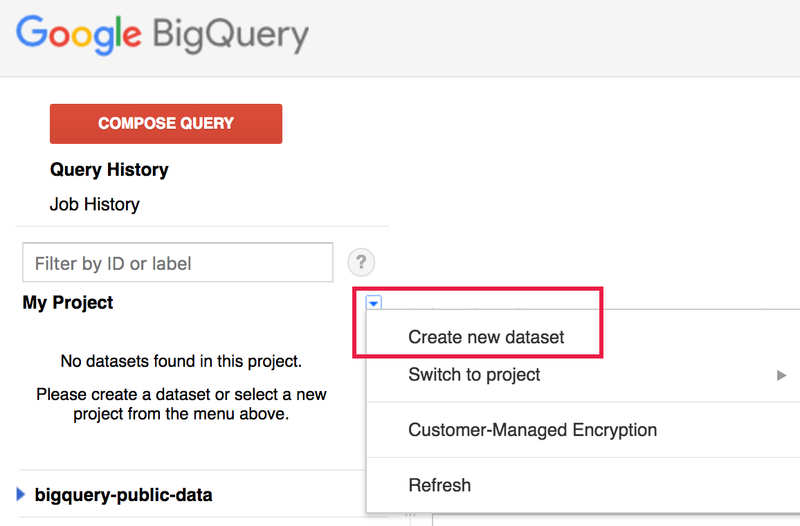 # Create the new BigQuery dataset. # storing the query results. # Configure the query job. # Set the destination table to the table reference created above. # The query selects the fields of interest. Check Success: Go to the BigQuery Web UI to confirm the creation of the natality_regression dataset and the regression_input table. 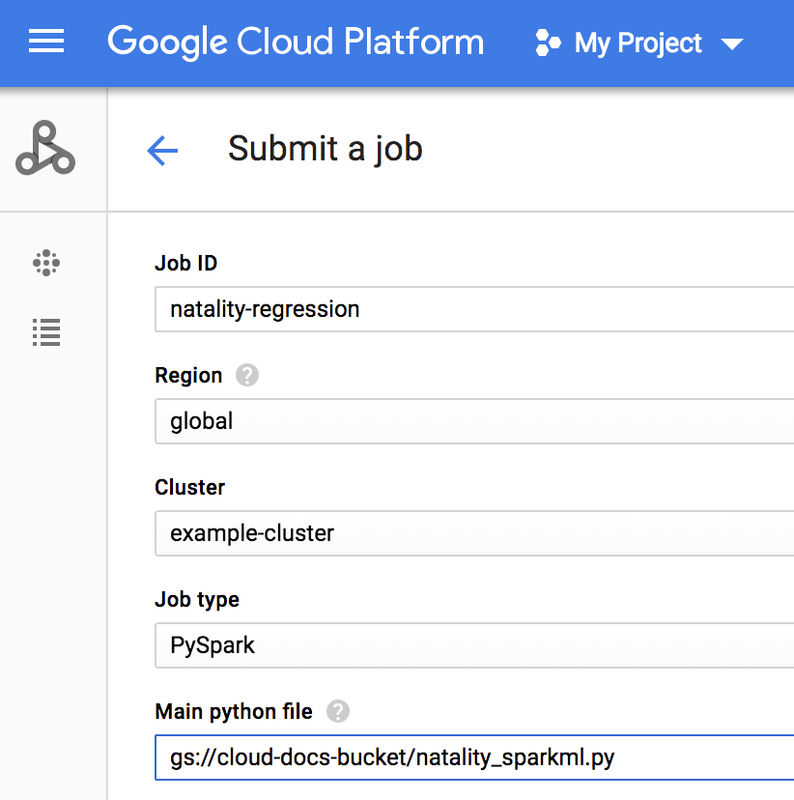 In this section, you'll run a PySpark linear regression from the Google Cloud Platform Console or your Cloud Dataproc cluster's master node. Copy and paste the following code into a new natality_sparkml.py file on your local machine. """Run a linear regression using Apache Spark ML. # regression as well as the Vectors types. # (mother_age, father_age, and gestation_weeks) into a vector. # Set an input directory for reading data from Bigquery. # Set the configuration for importing data from BigQuery. # and the project ID, dataset, and table names for BigQuery. # Read the data from BigQuery into Spark as an RDD. # Extract the JSON strings from the RDD. # Load the JSON strings as a Spark Dataframe. # Create a view so that Spark SQL queries can be run against the data. # As a precaution, run a query in Spark SQL to ensure no NULL values exist. # Create an input DataFrame for Spark ML using the above function. # Construct a new LinearRegression object and fit the training data. # Print the model summary. Copy the local natality_sparkml.py file to a Cloud Storage bucket in your project. Instead of copying the file to a user bucket in your project, you can copy it to the staging bucket that Cloud Dataproc created when you created your cluster. Run the regression from the Cloud Dataproc Submit a job page. Insert the gs:// URI of the Cloud Storage bucket where your natality_sparkml.py is located. Select PySpark as the Job type. Click Submit to run the job on your cluster. When the job completes, the linear regression output model summary appears in the Cloud Dataproc Job details window. R^2: a measure for how much of the "signal" the model captures. Residuals: the difference between the prediction of the model and the actual value for each point that was used to fit the model. SSH into your Cloud Dataproc cluster's master node. Go to your project's Cloud Dataproc→Clusters page. Click your cluster name to open the Cluster details page. Then, click the VM instances tab and select SSH→Open in browser window. A terminal window that is connected to the master instance opens in your browser. Run pyspark to open a PySpark shell. Copy and paste the following code into the shell, then press to run the Spark ML linear regression. The linear regression output (model summary) appears in the terminal window when the job completes. <<< # Print the model summary. only showing top 20 rows. After you've finished the Use Cloud Dataproc, BigQuery, and Spark ML for Machine Learning tutorial, you can clean up the resources that you created on GCP so they won't take up quota and you won't be billed for them in the future. The following sections describe how to delete or turn off these resources. Run the following commands to obtain the name of the bucket in your project that was used to store the temporary data files (this bucket starts with the characters "dataproc-"). Insert the name of your cluster, as shown below. Go to your project's Cloud Dataproc→Browser page, then click on the TEMP_DATA_BUCKET name. Inside the tmp/ folder, you will see a folder that starts with the name"natality-" (the remaining characters represent the date and time that the folder was created). This is the temporary input data folder to remove. Select the check box to the left of the natality- folder name, then select Delete at the top of the page to remove the folder from Cloud Storage.